Kindle Fire HD: How Amazon's new tablet will revolutionize books, movies, and games. 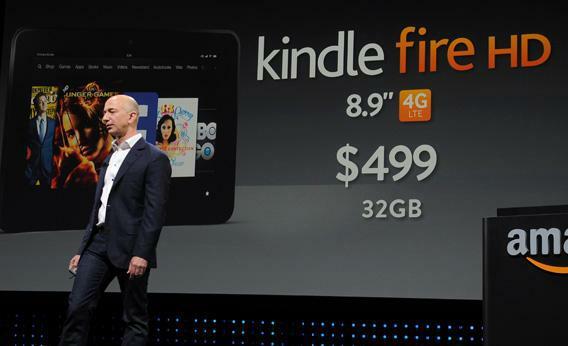 Jeff Bezos introduces Amazon’s new Kindle Fire HD on Thursday in Santa Monica, Calif. Along the way, Bezos introduced some new products—there’s an e-reader, the Kindle Paperwhite, with a brilliant illuminated screen, and new Kindle Fire HD tablets that are decked out with faster processors and better displays than last year’s Fire. But the particulars about the new gadgets felt like a sideshow to the larger story. Ever since it launched the Kindle, we’ve known that Amazon had ambitions to become a full-fledged hardware company. Last year, when it released the bare-bones Kindle Fire, we thought we had a sense of what kind of hardware company Amazon wanted to become—it would create low-end devices, sell them at cost, and aim to make money through content to read and watch on those devices. It remains to be seen whether Bezos has actually done that. I got to play with the new Kindles for a few minutes in Amazon’s press demonstration area, and while I found them pretty impressive, I didn’t have nearly enough time to come to any conclusions about how they’ll stack up against Apple’s stuff. So how will Amazon compete? It wants to innovate on price and content. Price is easy: Because it doesn’t care about profits on devices, it will always sell its hardware for much less than Apple can. Amazon’s top-end Kindle Fire HD, which offers 4G cellular access, is $499; that’s the same price as the Wi-Fi only model of Apple’s latest iPad. What’s more, Amazon has cooked up a 250 MB per month wireless plan for the 4G Kindle that goes for only $50 a year; a comparable AT&T plan for the iPad is $180 per year. But wait, there’s more. Bezos also wants to make it so that when you buy a book, movie, or game from Amazon, it actually works better than if you bought that book, movie, or game from some other store. Amazon is doing this through small but potentially addictive features that will alter how we experience digital media. Take “immersion reading,” a new feature that will allow you to synchronize an audiobook with a Kindle book. If you listen to the audio version while you’re working out, your Kindle will automatically switch to the right spot in the text when you get back home and start reading. Then there’s X-Ray, a feature that allows you to see “the bones” of books and movies. Click on it in a novel and you can see a timeline showing where each character makes an appearance; in a movie, it tells you all the actors in a certain scene; in a textbook, X-Ray gives you an instant glossary within the body of the text. These features might not sound revolutionary, but together, they add up to a sublime experience. I bet that once people try X-Ray, they’ll get hooked, and reading and watching on other devices will feel like an inferior experience. And then there’s Amazon’s relentless pursuit of new forms of content. Its digital store now offers more than 22 million books, songs, movies, and games, with many of them available for free with a subscription to Amazon’s Prime shipping service. A growing number of books make their way to the Kindle through Amazon’s self-publishing system, which allows authors to bypass the traditional publishing world entirely. These books, which are exclusive to the Kindle, have turned out to be really popular—27 of the top 100 Kindle books are self-published, Bezos said. Today, Bezos unveiled one more addition to his content smorgasbord. Amazon is launching serialized titles, letting authors publish books in installments. Serialization has all but disappeared in the publishing industry since the days of Dickens. Now Bezos may have found a way to resurrect a long-lost art form. Nearly a year ago, after Steve Jobs died, many in tech wondered who would replace him as the industry’s new force for innovation. Bezos was an obvious suspect, and today’s presentation offered many opportunities to spot superficial similarities between the two. Like Jobs, Bezos spoke slowly and deliberately, and he talked about his business philosophy just as much as he talked about technology. Yet it would be wrong to say that Bezos is aping Jobs, or that he’s trying to build a new Apple. He isn’t. Amazon is turning into a new and potentially powerful force in the hardware business, a company that could clobber its rivals by marrying compelling content to hardware that’s just good enough, at prices that are unbelievable. If this plan works, it could be unstoppable.